The past couple of days have been busy ones. We’ve had to clean the entire house to get ready for tonight’s Seder. 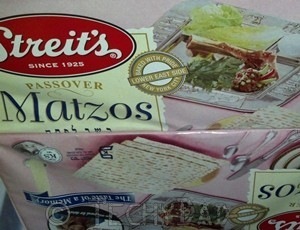 Yes, tonight begins the holiday of Passover. Passover celebrates the ancient Hebrews’ freedom from slavery in Egypt. Of course, as the story goes, since the Jews left Egypt so quickly, they didn’t have time to let their bread rise. Therefore, for eight days, all leavened products aren’t allowed. Bread, cakes, cookies, and more are no-nos. To limit our food choices even more, custom forbids a list of other foods including corn, rice, and beans. Instead, we chow down on matzoh, matzoh, and more matzoh. We’ll eat matzoh and cream cheese, matzoh brie, matzoh pizza and more. It’s always a difficult holiday because of the combination of massive cleaning, switching of pots/pans/dishes/etc, and dietary restrictions. Of course, I observe the holiday by going offline for the first two and last two days. This means that I’m not going to have time to post additional blog posts for the next couple of days. I’ll be back on Thursday, though. Perhaps with photos of our Seder. If you celebrate Passover, I hope you have a wonderful holiday. If you don’t, I hope you have a wonderful week and I’ll see you in a few days.